A lot of interest at a common man’s level was generated recently when the country rating for USA was downgraded from AAA to AA+ .While it might have been a coincidence, very little actually is known regarding what is a country rating, how it’s done and the implication it carries. Other questions that come to one’s mind are – how many such agencies are involved in such ratings, is there any accepted yardsticks on the basis of which it’s carried out and what’s the source of information on the basis of which such ratings are done? The credit rating represents the credit rating agency's evaluation of qualitative and quantitative information for a company or government; including non-public information obtained by the credit rating agencies analysts. Credit ratings are not based on mathematical formulas. Instead, credit rating agencies use their judgment and experience in determining what public and private information should be considered in giving a rating to a particular company or government. The credit rating is used by individuals and entities that purchase the bonds issued by companies and governments to determine the likelihood that the government will pay its bond obligations. A sovereign credit rating is the credit rating of a sovereign entity, i.e., a national government. The sovereign credit rating indicates the risk level of the investing environment of a country and is used by investors looking to invest abroad. It takes political risk into account. It seems a bit strange that while Ireland which has been struggling economically but for the bail out packages is BBB+ while India which has consistently been achieving a GDP growth rate of 8% + is rated BBB-!. India’s internal credit rating is lower than that of countries under severe financial stress. Lets try and unravel some of the factors involved in the country rating. There are four major pillars determining a country’s rating – its Economic resilience which is dependent on 1) economic strength, 2) Institutional strength and financial robustness which is pillared on 3) financial strength and 4) event risk. While it’s not disclosed by the rating agencies, it is expected that per capita GDP, Real GDP, Inflation rate, Gross Investment/GDP, and openness of the economy determines the economic strength while Government Effectiveness, Rule of law, political stability (all these three terms as defined by the World bank) and the corruption index (as defined by Trans International) determine the Institutional strength of the country. 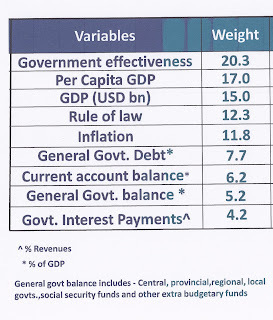 Government financial strength is perhaps determined by Govt. rev/GDP, Govt. primary balance/GDP, Govt. debt/Govt. rev, Current Account balance/GDP and Interest paid on external debt and the susceptibility to an Event risk refers to a risk of debt default due to Financial events such as speculative crises; Economic events such as the earthquakes and other natural disasters or Political which includes war or political chaos/instability. A look at the country rating of BRIC countries vis-à-vis some of the vulnerable countries (Portugal, Ireland, Italy etc) often is baffling. While India and Brazil have AAA-, Ireland has BBB+ . While China has AA-, Italy has A+! One often wonders where there’s any bias against the emerging countries. 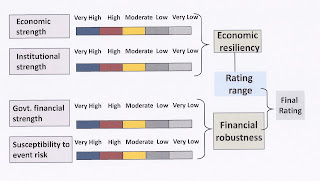 While the exact strategy and the factors which are considered by the rating agencies are not exactly known, based on the above analysis one can make a calculated guess that certain factors which may reflect the prevailing situation more realistically not considered while arriving at the country’s rating. For instance, per capita GDP is considered and this will automatically put countries such as India & China in a disadvantageous position. Also the fact that countries like India and China have a relatively younger population and will have a demographic advantage gets neglected in the process. While countries like Italy may have a higher per capita GDP based on the existing population, it doesn’t capture the equally, if not more important, the fact that the actual population in Italy is declining. More importantly, the Purchasing Power Parity (PPP) is not considered and the absolute GDP is taken into consideration. Automatically thus, countries with higher absolute GDP get an advantage whereas countries such as India whose GDP might be lower in absolute terms but will be higher if PPP is considered are at disadvantage. Also, factors like unemployment ratio etc are perhaps not considered. It clearly gives an impression that the country ratings are from a commercial view point ie the attraction of the country as a trading destination. While it is important to look into the rating criteria which required institutional strengthening and take up necessary measures accordingly, it is equally important for emerging countries, esp. the BRICS countries to take it up with the rating agencies the fact that ratings should reflect a more realistic scenario. Otherwise, such ratings will continue to be an exercise in ‘self-denial’ as countries like China take off.